Stars of the blogosphere; that’s us! Isn’t it nice when people want to write nice things about you? That’s a rhetorical question really. No ones’s going to object to having someone sing their praises; just like no one’s going to argue that children having cakes on their birthdays isn’t an important thing. The thing is though, people don’t always know that there are kids who go without birthday cakes. Even our patron, Natalie Coleman, who, by the way, is about as down to earth as it’s possible to be, admitted to us the other day that it was hard to comprehend kids going without. It’s not a nice thing to think about, but the number of families struggling to feed their children – and themselves – breakfast, lunch and tea, let alone cake, is probably greater than you think. That’s why it’s incredibly important that people share what we do. 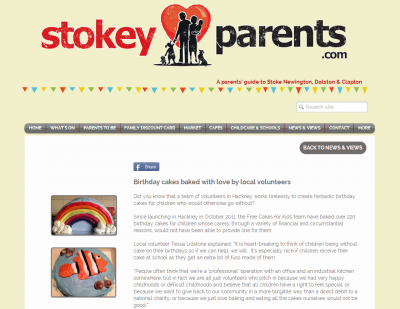 Of course we love it when our bakers get the recognition they deserve, in print, for the contribution they make to local children’s lives, but we really, reeeally love it when someone reads something about what we do and then gets in touch as a result of it, enabling us to help one less child go without a cake on their birthday. True story: One of our committee member’s mum was so proud of her daughter’s involvement in FCFK Hackney and the fact that it had been written about in the Telegraph, that she took the article into her work to show off. One of her colleagues knew of a family in need; got in touch with the Free Cakes network; and a child in that family got a cake when it was their birthday. If it wasn’t for the Telegraph article that might never have happened. Totally, totally awesome. 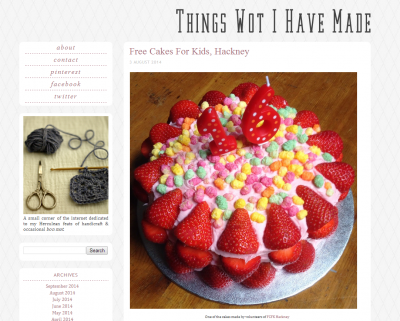 It’s with that in mind that we’d like to thank two bloggers – Jenna over at Stokey Parents and Zoe from Things Wot I Have Made – for writing about us recently. We already know that another Free Cakes group has gained a baker as a result of this writing. Bonus. Take a read of what they wrote here and here, and, please, share, share, SHARE what we do. And if you work with families and children here in Hackney and think that you know people who could benefit from our service then please do email us on hello@freecakesforkidshackney.co.uk. Referrals are quick and easy. We always say that, but it’s true. And if you want to write about us we probably ain’t going to object either!